Objective statement: In a nursing student resume the objective statement should inform the reader that the applicant is still a student. Describe the type of position you are seeking and display some enthusiasm. Skills: The location of the skills section depends on the skill set you have and the position you are applying for. Graduate level students or students who have worked in the medical field previously may have enough skills relevant to the position to warrant placing the skills section here. Somebody with no experience at all may want to put their formal qualifications and certifications here. There are skills that can be gained through certification prior to graduation. Formal qualifications and certifications: Provide information on the program you are enrolled in and projected graduation date. If you are a graduate student list other degrees. You wouldn’t include high school unless you are a recent high school grad. List any relevant certifications you have already completed. Employment history: List any previous nursing employment if you have any. If not list previous jobs held. If you worked a job where you developed relevant transferable skills focus on those. The best for students with no working experience anywhere is to focus on their performance in nursing school. Resume focus for those with work experience but not in nursing, like, say, bus driver resume can focus on transferable skills and school performance. Graduate program students could focus on skills, research and academic performance. Is the overall appearance of your resume pleasing and neat and does it look professional? Is the length limited to one page? Is the most important information highlighted? It could take some time to work your way through a full checklist, but once completed you will know you have put your best effort into your resume. Nursing student resumes also provide you with the opportunity to hone your resume writing skills. Check this RN resume as your guide! According to the American Association of Colleges of Nursing (AACN), 111,634 students graduated from baccalaureate nursing programs in 2014. That included 63,857 students from entry-level programs and 47,777 students from baccalaureate degree completion programs. A total of 33,250 students graduated from master’s programs in nursing, 743 from research-focused doctorate programs and 3,065 from practice-focused doctorate programs. The number of students enrolled in baccalaureate nursing programs, masters nursing programs and DNP programs increased in all programs and that trend is expected to continue. 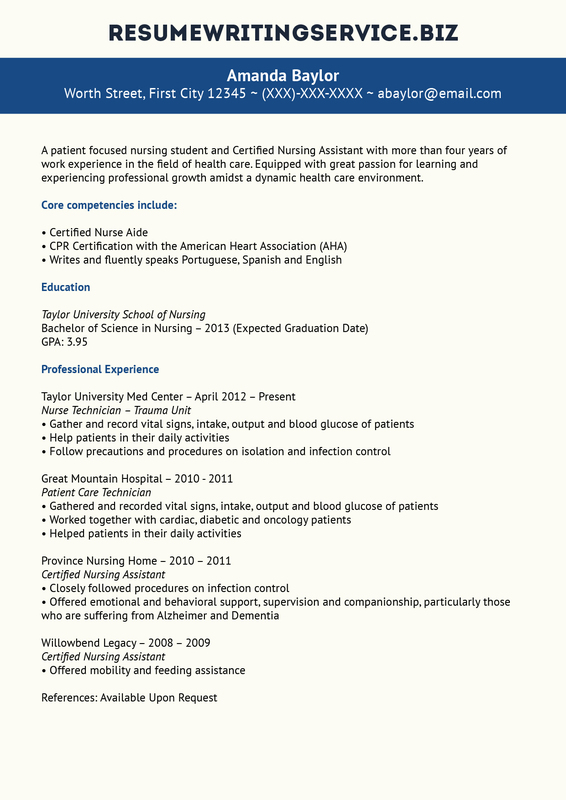 If you feel more confident, you might want to review this great experienced nurse resume now! If you need help with your nursing student resume, our experts can help you 24/7!